In a little over a month, we will be celebrating Thanksgiving again, and then the final rush into Christmas preparations begins. Which means writing dozens of Christmas cards and sending them out in time before the cut-off date. Which means that now is the time to start crafting Christmas decorations and Christmas cards. The latter a thing I never did back in Germany. While Christmas cards need to be crafted now already, why not still enjoy fall creations for your door step? Sometimes I think it strange that I was working as a journalist with the creative crafts industry for almost 16 years way back when, but never really found the time to create my own Christmas cards. I did make my own little floral advent arrangement every year. But no Christmas cards. I had all the materials on hand, free samples from manufacturers who wanted me to experience their products outside their workshops to which I also was generously invited. I acquired skills in a whole lot of different techniques. But I rarely put them to use. There was a simple reason: I was working 12-hour-days, writing, organizing events, often traveling at that. Coming home, I didn’t feel leisurely enough to create even more. And let’s face it – crafting dozens of cards tends to become work when under time pressure. My life was turned upside down when I came over here. Suddenly I had all the time in the world, all the materials at hand, and amazing craft stores all around into the bargain. I started to paint again until the walls in our house were covered with what I call regular art and my attempts on canvas. I began to create decoupage objects again – little boxes, coasters, even a guitar pedal. I helped with the Kids Club at the Steilacoom Historical Museum and introduced some fun papercraft and painting projects there. At one time I even introduced a group of ladies to Heritage Crafts – we decorated wooden Kleenex boxes with tole painting. 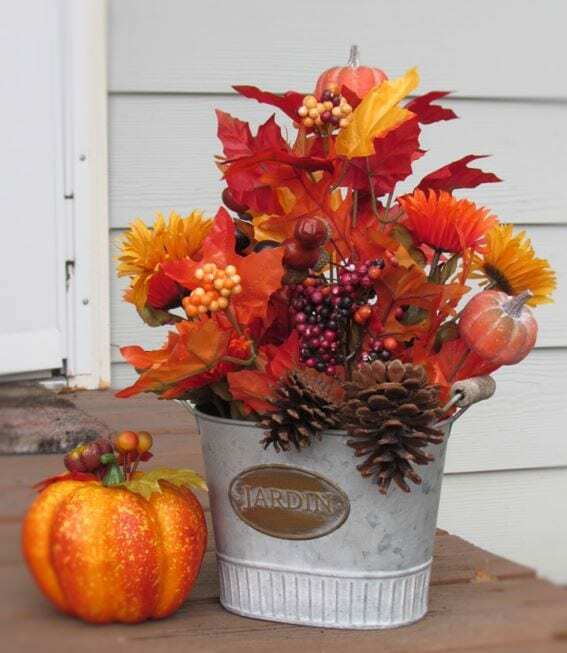 Table decorations for the fall can be small but very atmospheric. These days, I am grabbing my boxes of crafting paper, blank greeting cards, stickers, stamps, glitter, embossing powders, special effect pens, silhouette scissors, punches, and ribbons again and set to work. Around 50 greeting cards are waiting to be made. I haven’t decided on a specific look yet. Maybe, I’ll cut some windows into the cards with a die cut machine. Maybe I’ll add some song lyrics. Maybe I will create something 3D that is not too difficult to squeeze into an envelope and that won’t obstruct a post office’s stamping machine. Later, it will be time to think about advent decorations. The First of Advent will be only on December 2 this year. German private households usually don’t start decorating before Eternity Sunday – so there’s a relaxed timeline. Maybe, our Christmas tree will go up at the same time, for the sake of my husband’s American traditions – ornamented with a load of handcrafted ornaments made from wood, from beads and wire, or simply painted. But wait – it’s only October. Why run ahead that far?! It’s just about the Christmas cards and some wax candles for now (because I know how quickly nice, non-perfumed stump candles sell out). We still have some beautiful weeks of fall lying ahead – with pumpkin decorations, colorful foliage, scarecrows, grapes, asters, maybe some crows in the medley … or a turkey. I better see to it that my decoration for Thanksgiving is set up nicely. A floral arrangement on the doorstep, some small bouquet on the dining table … Only the other day I found a pretty candle arrangement that I had crafted a few years ago and that by now had come unglued. I might want to craft something like that again. If I’m in the mood to do so. There is no hurry, no pressure there. Everything will fall into place – in the end, holidays are grounded in one’s heart. If they were only all about decoration, what sense would they make? Your article brings back memories. I used to knit, crochet, sew our clothes, and create other crafts that struck my interest, but then life changed and I dropped all my crafts. I would have my Christmas cards addressed and ready to mail by the first of December. Now, I no longer send out Christmas cards. You did bring back some lovely memories… Thanks!